Prostaglandin E2 (PGE2) is a bioactive lipid that elicits a wide range of biological effects associated with inflammation and cancer. PGE2 exerts diverse effects on cell proliferation, apoptosis, angiogenesis, inflammation, and immune surveillance. This review concentrates primarily on gastrointestinal cancers, where the actions of PGE2 are most prominent, most likely due to the constant exposure to dietary and environmental insults and the intrinsic role of PGE2 in tissue homeostasis. 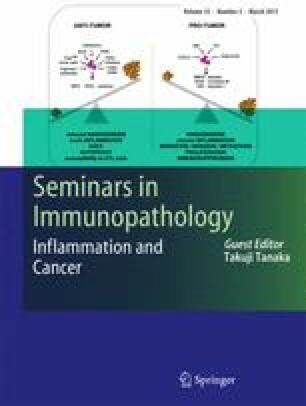 A discussion of recent efforts to elucidate the complex and interconnected pathways that link PGE2 signaling with inflammation and cancer is provided, supported by the abundant literature showing a protective effect of NSAIDs and the therapeutic efficacy of targeting mPGES-1 or EP receptors for cancer prevention. However, suppressing PGE2 formation as a means of providing chemoprotection against all cancers may not ultimately be tenable, undoubtedly the situation for patients with inflammatory bowel disease. Future studies to fully understand the complex role of PGE2 in both inflammation and cancer will be required to develop novel strategies for cancer prevention that are both effective and safe. We are gratefully indebted to Emmanuelle J. Meuillet, PhD, Arizona Cancer Center, University of Arizona for her contribution to this project. This work was supported by NIH grants CA-125691 (DWR), CA-114635 (DWR) and CA-138702 (EM).